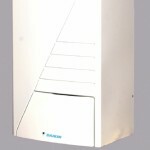 Daikin Airconditioning UK Ltd has introduced a highly energy efficient domestic hot water (DHW) module, which, when connected to the refrigerant circuit of a Daikin VRVIII HR heat recovery system, enables hot water to be produced from surplus heat recovered from the VRV to be transferred to a building’s domestic hot water or heating water circuits. Since no energy is required to heat the water during heat recovery, it is effectively produced free of charge, generating considerable savings in overall system running costs. Designed primarily for use in commercial offices, the new module/VRV combination represents an innovative total solution for the provision of DHW for office kitchens, restaurants, wc/shower facilities and staff break out areas as well as for heating by under floor loops, fan convectors and low temperature radiators. Available in heating capacities of 8 and 16kW, the unit has a built-in circulating pump, which supplies hot water at a flow temperature of 50ºC max to an associated stainless steel storage cylinder of 150, 200 or 300 litre capacity. All hot water controls and user interface are located within the module, simplifying maintenance.